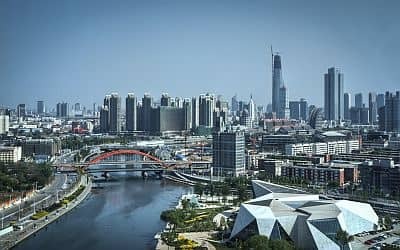 In Tianjin (or Tientsin), a metropolis located southeast of Beijing (compared to which it has a similar but slightly milder climate), on the Bohai Sea coast, the climate is continental, with cold but sunny winters and hot, sultry, and rainy summers. Like many areas of China, the city is affected by the monsoon circulation: in winter, the northwest cold currents prevail, while in summer, they are be replaced by hot and humid currents of tropical origin. Spring and autumn are transitional seasons. Here are the average temperatures. Precipitation amounts to 510 mm (20 inches) per year: the rains are not abundant but are concentrated in the summer months. Here is the average precipitation. In winter, the average temperature is around or below freezing (0 °C or 32 °F); sunshine is quite common, and a cold wind often blows from the deserts of Mongolia. On colder periods, the temperature remains below freezing even during the day, and at night, it can drop to -15 °C (5 °F). Although the winter is a dry season, sometimes it can snow. In winter and especially in spring (March to May), the city can be affected by the yellow dust coming from the deserts of Mongolia and Central Asia, which forms a characteristic haze and brings breathing problems and eye irritation. On the other hand, when the wind is weak and the air is stagnant (a situation that occurs more easily in winter, while in summer, it goes better because the heat makes the air rise, in addition, it can rain), the city can be affected by smog. In spring, the temperature increases rapidly, so much so that it often exceeds 20 °C (68 °F) already in April, while in May, the average maximum is around 26 °C (79 °F), which confirms how early warm weather arrives. In June, it's already hot as in the middle of summer, then, in July and August, the maximum temperature does not increase any more because the summer monsoon arrives around mid-June, bringing rains, sometimes heavy, and high humidity. So, the summer in Tianjin is hot but especially muggy. July and August are the rainiest month. Anyway, there may be entire weeks without rain even in summer, and these periods are usually the hottest ones, with highs about 35 °C (95 °F) and the perceived temperature even exceeding 40 °C (104 °F) because of the humidity. In the neighborhoods closest to the sea, however, the breeze tempers the heat a bit. The monsoon is quite irregular, here as well as in the north-eastern part of China, so the rains may be more or less abundant depending on the year. In autumn, the weather improves, rainfall decreases, and already in October, the rains become quite rare. By September, the humidity decreases and the temperature becomes pleasant, while in October, the nights begin to be very cool. The sun in Tianjin shines quite often all year round, for a total of 2,375 hours. The least sunny months, at least when considering the length of the days, are July and August. Here are the average sunshine hours per day. Near Tianjin, the sea is very cold in winter, but it warms up a lot in summer, reaching 25 °C (77 °F) in August. 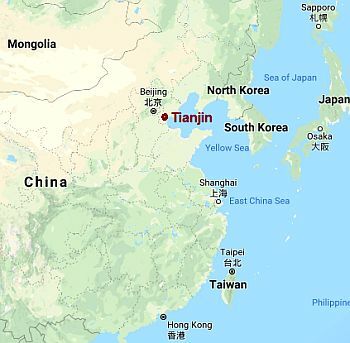 From July to early October (and occasionally also in the second half of June), Tianjin can be affected by typhoons, the tropical cyclones of South-East Asia, although this area of China is less exposed than the south. The best times to visit Tianjin are spring and autumn, in order to avoid both the cold of winter and the heat and the rains of summer, and in particular, from mid-April to mid-May and from mid-September to mid-October.